Bracket, a leading clinical trial technology and specialty services provider, will launch its next generation clinical outcomes platform, Bracket eCOA℠ 6.0, at the 52nd Annual DIA Meeting held on June 26 – 30, 2016 in Philadelphia, Pennsylvania. A demonstration of eCOA 6.0, the first electronic Clinical Outcome Assessment product of its kind to fully integrate with RTSM, will be held at DIA Booth #715. Bracket eCOA 6.0 is a flexible platform for electronic clinical outcomes assessments that is driving digitization in clinical trials. 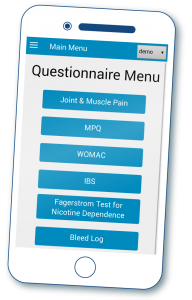 The platform integrates with industry-leading Samsung Galaxy smartphones and tablets, and Microsoft’s Surface Pro Windows tablets to support ePRO, eClinRO and eObsRO, and features fully integrated clinician and patient-facing tools, to ensure the experience is fully harmonized for any user. The platform’s integration with industry leading Clinical IRT solution, Bracket RTSM, enables subject questionnaires that trigger enrollment eligibility and randomization to kickoff schedule of reported outcomes entries. Its advisory services support scale design, development, licensing and validation, rater training and certification, clinical review and quality assurance, data analytics and compliance tracking. You can learn more about Bracket eCOA here.